Porter Robinson's home studio includes this M-Audio Fast Track Pro audio interface. 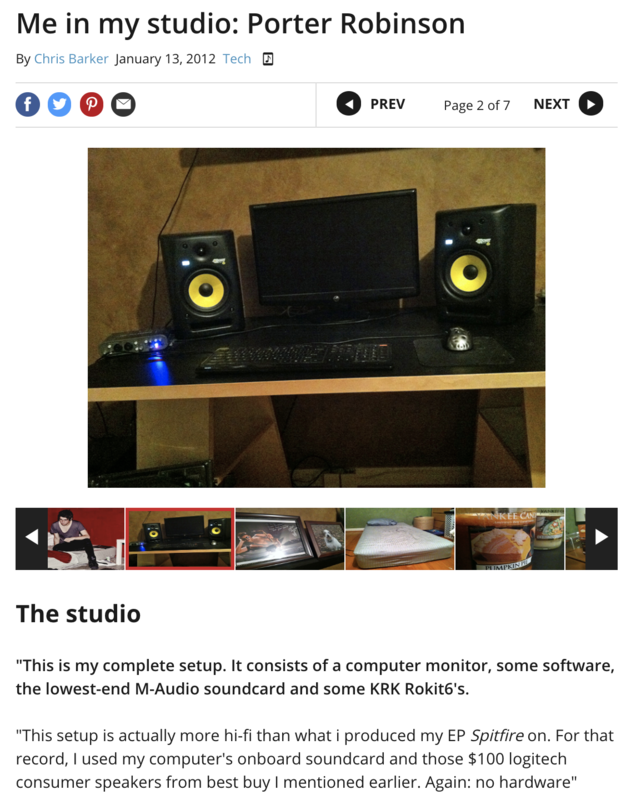 It can be seen on the left in this photo, from the MusicRadar article [Me in my studio: Porter Robinson](https://www.musicradar.com/news/tech/me-in-my-studio-porter-robinson-523449). A photo shared by Afrojack on Twitter in July 2013 shows his studio gear setup. On the left side of the pic is the box for an M-Audio Fast Track Pro interface. It's possibly a new piece of gear and still in the box, or the audio interface Afrojack uses when traveling. "I used this to make so much music this simple bit of kit is the reasons I got to where I am today!" - route 94. At 1:12 we can see that it was it first audio interface. The item can be seen 00:01 into this video, under the his monitor. "Great portable sound card that sounds great"
Seen in his previous studio, a Fast Track Pro can be seen from time to time to record various synths. Also used for select DJ sets. This video shows Adrenalize utilizing the M-Audio Fast Track Pro. Served me for me years but unfortunately now obsolete through Logic Pro. I replaced it by a Focusrite 2i2 with similar characteristics. I have produced an album and dozen of releases with this one. I have also done few dozen digital dj gigs using Traktor and this little beast as my sound module. Sound quality is excellent and recording is really good too. 5 start product if you ask me! Ideal for beginning producers. Also very easy to carry with you, so you can record on distance. The sound card I'm using currently for my productions. Currently my back-up recording interface, only gets used when the PreSonus isn't cutting it. Bought it from my friend Shawn who was looking to get rid of it (and his Pro Tools M-Powered 7 which I never use). A little expensive but overall a great soundcard. I have worked with a ridiculous variety of interfaces since 1990. Avid beasts to Universal Audio to Apogee and Antelope.... This secret tiger is a tank. It never fails and is mostly just used for performance at this point and not in the studio but I do fire it up at home when needed. Got the job done when I needed a no fuss, no muss way to get into the laptop. Mine was even a reject model. If I remember correctly cuz the M-Audio was screened on crooked? Anyway, still got it but haven't used it since I got the Duet. Definitely recommend for any beginner who needs a dead cheap way into their computer...unless Focusrite has something at the same price point...tho it just a guess these have gotta only be like $50 bucks tops now. I've been using the Fast-Track pro for about 3 years now and its been an amazing ride. Its lightweight, small and powerful. I use it in my studio for recording vocals, guitars and any other acoustic instrument. Its an excellent piece of gear. Good AD/DA interface for a friendly price. The housing is made of plastic. The buttons are small. Nice exernal unit, had it for a long time now.